"Texas military officials are begging Texan drone pilots to get their gadgets out of the sky, because they’re interfering with rescues. '#ALERT: We are seeing civilian drones that pose EXTREME risks to our rescue pilots and crews in high need areas,' the Texas Military Department tweeted from an account that links to the official site, which represents the Texas Army National Guard, the Texas Air National Guard, and the Texas State Guard." "We’ve all seen plenty of heartbreaking images from Texas this weekend, as vicious floods continue to destroy lives and property in the wake of Hurricane Harvey. But some of the most chilling footage has been taken from the sky, as hobby drones in the region document the devastation that’s still taking place. Modern technology like social media and smartphone cameras now bring images of natural disasters to people around the world in an instant. And with this decade’s rise of drones, the bird’s eye view has become nearly as ubiquitous as any other." So to document the flood, drones are almost essential. But they can get in the way of rescue flights. What to do? Coordination seems to be the only way around that. I'm not sure the best way has been found yet. and here is Forbes.com weighing in. "According to media reports, the logger became trapped when a tree fell onto his hand. Due to the geography of the environment, Danville Life Saving Crew opted to launch their recently-acquired drones. DLSC assistant director Bryan Fox told news outlets his crew had recently become certified as drone pilots, and seized the opportunity to utilize the new tool. While responding to the call, members of the Danville Life Saving Crew constructed a strategy of how to rescue the injured logger. When rescue efforts began, Fox piloted a drone to safely guide the rescue boat to the worker. Due to heavy amounts of debris and rocks, the drone was able to see what the boat operators were not. The drone was also used to help guide members up the embankment." Now that will catch on I'm sure. A search and rescue guy here told me, though, that they don't plan on using drones for some kind of legal liability reason. This is a case where a quadcopter can do something pretty much nothing else can. "Quick-thinking pilots were forced to perform evasive maneuvers to avoid colliding with a multi-rotor drone while preparing to land at Israel's Ben Gurion airport in Tel Aviv. The plane, with up to 180 passengers, was en route from Romania when the incident occurred and, thanks to the actions of the pilots, made a safe landing." "Weighing 50kg, TIKAD is capable of flying anywhere between 30 and 1,500 ft and can carry a wide arrangement of semi-automatic weapons plus a 40mm grenade launcher. 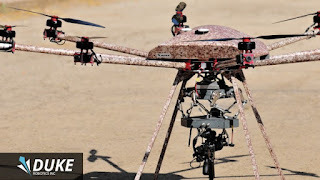 It’s built with proprietary recoil stabilisation technology, offers high levels of accuracy (well, you’d hope so) and is completely remotely operated." I dunno. This is probably inevitable. But like so many products, the military always wants to weaponize everything. "The Pentagon has issued new guidelines giving the military the go-ahead to down drones flying near or over select US military bases. The guidance was issued to domestic military installations Friday following classified guidelines that were first issued in July by then-Deputy Defense Secretary Bob Work. Friday's guidance was designed to help bases communicate with local communities about the new restrictions." So idiots will lose their drones. That's a good start. "A drone caused travel chaos and forced Sweden's busiest airport to halt air traffic for security reasons between around 3.50pm and 4.50pm on Monday, authorities said. During this time, two incoming flights warned they were low on fuel and were therefore given permission to land despite no other planes being allowed to land or take off. Emergency services, ambulance and police were called to the runway as a matter of routine, but both planes landed normally. " What are drone flying rules in Sweden? operators wishing to gain their Permission for Commercial Operations from the CAA (previously referred to as a PFAW, now PFCO). The training and assessment covers Knowledge, Practical Flight, Operations Manual and Application for the Permission. In other words, everything required to demonstrate both the required competency to be a pilot as well as the process required to obtain a PFCO." I don't think UK and US rules are a lot different. Good to see somebody helping with the licensing though. "UAVUS is the largest association of professional unmanned aerial vehicle operators in the United States. Our 5,000-plus members are leaders in the fields of aerial cinematography, precision agriculture, infrastructure inspection, real estate marketing, search and rescue, and more." "CICADA is a concept for a low-cost, GPS-guided, micro disposable air vehicle that can be deployed in large numbers to 'seed' an area with miniature electronic payloads. Regarding their low cost, Evan Ackerman in IEEE Spectrum, said, 'They can carry a small sensor payload, and they're designed to be cheap enough that you can use a whole bunch of them all at once.' Another factor weighing in is a 3D-printed fuselage, which minimizes the amount of hands-on assembly time required, he wrote. 'These little guys cost about US $250 each,' said Ackerman." This doesn't explain quite what the value of such a system would be.